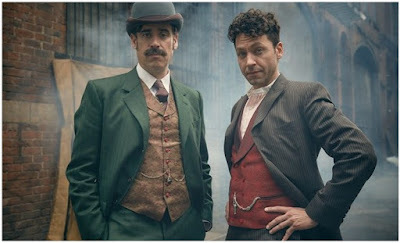 When winter ends in couple of months one of the first of the brand new period set television series to arrive to us with Spring will be HOUDINI & DOYLE with Michael Weston and Stephen Mangan in the titular roles. The historical crime series will air on ITV Encore in The United Kingdom, at Fox in the United States and also on Shaw Media in Canada, connecting the greatest magician of all times with the legendary creator of Sherlock Holmes! 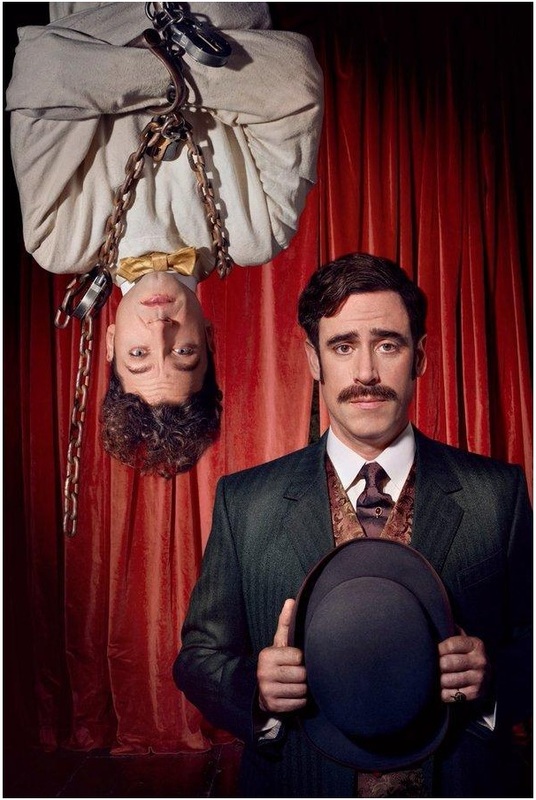 The show itself is based on their real life friendship, which was very unlikely to begin with given that Houdini was a debunker of mediums and psychics, while Doyle was an ardent spiritualist! 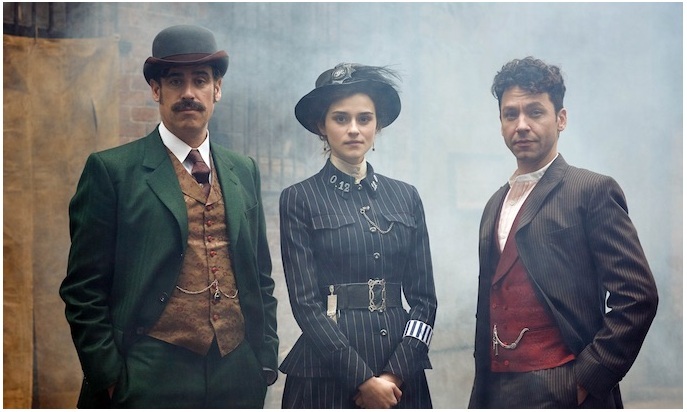 Inspired by true events, HOUDINI & DOYLE historical procedural draws heavily on the rich history of the period. Two great men of the 20th Century – Harry Houdini (Michael Weston) and Sir Arthur Conan Doyle (Stephen Mangan) – grudgingly join forces with New Scotland Yard in Edwardian England to investigate unsolved and inexplicable crimes with a supernatural slant. You will watch them teaming up in 1901 London at the behest of Constable Adelaide Stratton (Rebecca Liddiard), a somewhat fictionalized take on a little-known historical figure, to investigate crimes that might or might not have a supernatural component. In the ten episode series, the two of the great characters of the 20th century, Houdini, master magician, escape artist and paranormal debunker, and Doyle, creator of the world’s greatest detective and a paranormal aficionado, grudgingly join forces to investigate crimes with a supernatural slant. Although they’re both rich, famous and brilliant, they’re the original odd couple, with Houdini believing in nothing, Doyle in everything. Emily Carey will appear as Mary Conan Doyle! Interesting, teaming up Doyle and Houdini in a procedural. So...was that part of it true? Or is the fact of them working together fictional but the crimes they're investigating based on fact? according to some data they really did work together solving crimes for police in at least two cases. Sounds interesting. Probably one Jason will really enjoy. don't let him miss it then! Looks nice and atmospheric...to follow! I had no idea about any of this! All I knew about houdini is that he was a magician. Sounds like an interesting watch! interesting for sure!!!! Tell me some gossip girl types are also coming soon...I miss the college life drama! I've no idea, maybe something over at CW? And I didn't know Houdini and Doyle were friends. I love this kind of info. Thanks, Dez. 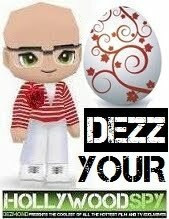 Have a good one. Every time I see something about Houdini, I find I'm holding my breath. It's those under water stunts that really get to me. I am sure that it will find it's audience.